As I stated on another comment you can NOT argue with a liberal as they do not rely on thought, logic, history, or any other fact based items. They rely exclusively on feelings and you just can not argue with that! As a former KGB agent revealed back in the '80s on one of the daytime TV talk shows, there is no logic you can use with folks like Robert. i'd say something rude, but life has clearly already done it's worst to robert. Does this not prove that Democrats/leftists: are mentally ill? Define words differently than conservatives? Are brainwashed? Are dangerous to society at large? Should be re-educated? I just thought of something else--Our son and I were talking about how horrible she is and agreed that no matter what happens in this life, whether or not she is prosecuted for her crimes, she will, as we all will, have to stand before our Maker and be judged. She won't be able to buy Him off, or kill Him, or in any other way avoid Him. Whether or not there is justice in this life, there will be in the next and all those who have done wickedly (without repenting) will have to pay for their own sins. It gives me comfort to remember that. So Robert thinks Hillary's aiding and abetting of the sexual assault of women over decades by her spouse is acceptable and is to be overlooked even though it is a failure of character and lack of moral compass. What happened to this guy to have so much anger and bitterness? He is obviously tainted by the kool-aid that he has been given in his life...I feel sorry for him when he realizes that he is the idiot for the leftist deep state evil people. Way to go Patrice...you have drawn out many with his attitude....we can watch out for them. Well, as they say in the south, "Bless his little heart!" Sorry you are subjected to the liberal banter. I still can't figure out why liberals can never express their opinions without personally attacking whom ever they disagree with. Guess we just gotta "bless their little hearts"!!! I think itis literally impossible for anyone to actually believe all of what he has said he believes. I think it is either sarcasm or he is trolling you. seriously no one could know so little about Hillary and also believe so much about her that is wrong and is clearly propaganda. No! He is not for real. Sadly, he is quite sincere. I've received emails for the past nine years from him (since I started writing for WND), all in a similar vein. Heavens, you should see what he has to say about homeschoolers -- it would curl your hair. Incidentally, he's a public school music teacher. Reason number 3,476 to home school. it's kind of a broad stroke, but i'll paint it anyway. no one goes to college to become a public school music teacher. people go to college to teach privately the best of the best or to become a professional musician. those that fail in those 2 paths become public school music teachers who get to teach mostly students that don't care about music and only picked the class for an easy a. i would imagine this type of ego crushing career path would be very psychologically damaging. The last sentence of your reply says it all. Not EVERY teacher is insane, but MOST are. I was married to one for five years and got to meet a lot of her co-workers. One even HATED kids, but figured it was a secure job. I am sorry but it would be cuter if it was colored in red. Well, this is America, and we still have freedom of choice...even to make lousy decisions based on crappy/fake news. And, yes, there are a lot of folks in this country who feel the same way. I have met more than a few of them. Intellect of a typical Hillary supporter. Robert is most likely a victim of low self esteem brought about by over indulgence in government assistance programs. Don't EVER try an argue with a liberal, they will take you down to their level and beat you with their experience.....You can't fix stupid! During this confrontation, which was so hilarious that one of the creators of the cartoon show "Rick and Morty" made a version of the dialogue with those character voices, the judge said something that nobody in America should ever forget. "You have a Constitutional right to be a dumbass!" At teacher wrote that?! My God, I am a truck driver and the misspellings and such was painful to look at. Sadly this is the type of screed that I hear from most of my family at each gathering. Thanksgiving was painful because everyone was railing at me and my kids due to TDS (Trump Derangement Syndrome). I was asked to not get into arguments with them by my stepmom so I just sat there and took it. Sadly, I will be a no show for Christmas this year as it is just not worth it to put my kids through that again. I will be meeting with my Dad and stepmom later Christmas day. There is just no hope for someone like Robert. Poor ignorant fool. I have to admit, when I read Robert's comments I had a lot of choice words I wanted to say but I thinks it's best to leave it in God's hands and pray for Robert. However, the Hillery tree topper did turn my stomach. After reading all the comments by others, I cannot say anything more about this man. Hillary and all of her kind are traitors and should be treated as such. I'm honestly fairly liberal. No longer as liberal as I was raised, but still fairly liberal. Hillary makes me feel more than a little bit ill. I don't understand how ANYONE can honestly believe she's on the side of the people. In other, more humorous thoughts... 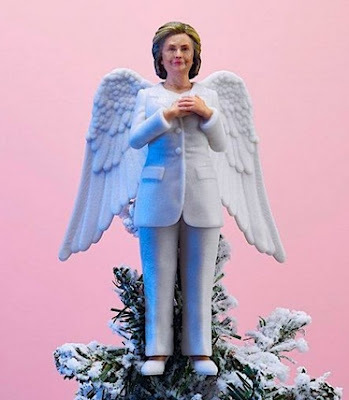 There is a certain well-known nasty Christmas ditty, to the tune of "Who Put the Ram in the Rama-Lama-Ding-Dong," involving a Christmas-tree angel... Superimpose a Hillary Angel on the song and enjoy a chuckle. As soon as you said "Robert" I knew what was coming. It's sad that he truly believes this tripe. You say he's a teacher? Unfortunately, the grammar and spelling are atrocious, but not far from what students are graduating college with these days. Poor Robert. He said it all when he said he is not a Christian. No wonder he doesn't see all her faults, he doesn't have a standard to compare her to. What would we do or be without the example of Jesus. I hope that no person or animal is in Roberts' way when he finally has a "come to Jesus" moment. Robert is his own worse enemy. Shaking My Head... He's the epitome of a CNN regurgitation.. Not an original idea in his... (dare I say it) Head? I can see the froth from his mouth as he types this diatribe. ...I thought he was describing Bill Clinton to begin with! LOL...poor guy. He drank the koolaide. Merry Christmas! What a terrible, evil person. I believe that Hillary Clinton is Satan. Who would vote for Satan? I would like to know how old Robert is and what was his childhood like and his education. He seems to live in a CNN, "Disney" world of fantasy, emotions and feelings instead of facts and truth. These kind of people seem to be afraid to take off there blinders to consider another thought for fear that they might agree with it and have their peers look down on them. They feel safer with the blinders on. It would be too stressful to have to reprocess new information with real facts and truth. They are lazy. I like my coffee black. I'm not afraid to put flavored cream in it at times. But I make that choice. Don't let others control you. Let your fingers to the typing. Think for yourself Robert. I’m a public school teacher, & just wanted to say we aren’t all bad or liberal. I teach art at a rough school. I love my students and am trying to make a difference in their lives. (I sure don’t get paid enough for that to be the reason I teach!). We discuss politics, religion, & many other topics in art and I try to help the kids see things in a balanced way and to research and think for themselves. I also try to get them to be creative, & to see beauty and goodness and to strive for those things in their lives. It has to be subtle, because so many oppose those ideas. Those of us in public education who feel this way are almost like spies in an enemy camp. There are kids who will listen (& many are “stuck” in the public education system). Keep both teachers and students in your prayers. There may yet be some good we can do. I know quite a few dedicated and loving public school teachers (not least my sister-in-law). I know you're fighting an uphill battle. Keep the faith! You ARE making a difference. I read Robert's comments as we approach the Winter Solstice. Unfortunately, his grossly distorted logic is as dark as the longest winter night!! He needs a good dose of Rural-Revolution common sense. We weep for people like Robert. At least I do. So much bitterness and hate. The liberals like to tout that they are so tolerant. Really? Only if the views expressed match or are close to their own. Last time I looked in the dictionary this is the exact opposite of tolerant. I truly hope that his students in his music class are not indoctrinated with his crap. Sadly, I fear they will not be left unscathed. I also applaud public school teachers who commit so many years to teaching mostly bratty kids who could care less about getting a good education. I also agree that it is a good reason to homeschool to protect our kids from such as him. We chose homeschooling at first because of health reasons for our oldest son, but found out home schooling was our best choice. It was NOT so popular when we started it almost 30 years ago. Happily our sons turned out just fine and lack the bad social habits of public school students. Poor Robert is incorrect about Ms. Clinton. I know someone who was on her staff for a foreign trip while she was First Lady. The friend said she was rude and profane. Additionally, she treated both staff and her family with contempt and derision. We all know that she also persecuted women who told the truth about her husband's sexual exploits. She is a horrible role model for any behavior we want from a senior-level female and especially from a Commander-in-Chief. Check out " Arkancide.com " Unfortunately it's just the tip of the Iceberg. Check out Arkancide dot c om, It is an eye opener.